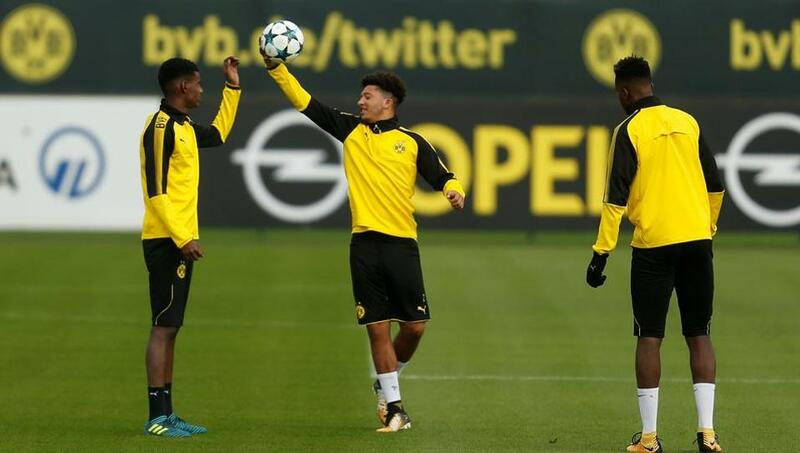 England player Jadon Sancho trains with his Borussia Dortmund teammates. Vinicius Junior didn’t make the passage to India. Jadon Sancho did but may leave halfway through the FIFA U-17 World Cup. Earlier in the year, it was only after Hector Bellerin was bullish about playing the European U-21 Championships that Arsenal relented. For the same competition, Jose Mourinho refused to let Marcus Rashford represent England. Instances of players not being released for the Olympics too is commonplace in football in Europe. So, England coach Steve Cooper was asked here before their FIFA U-17 World Cup opener against Chile on Sunday whether he thinks a case can be made to include this tournament in the FIFA calendar so that clubs will have to release players if they are fit and available. “The idea is an interesting one,” he said here on Saturday. And even though there was a specific reference to the prodigious Sancho in the question, Cooper replied without naming the Borussia Dortmund player even once. “With regard to the player you mentioned, we are about a team. Of course, players make a difference but if we are going to be champions in this tournament or any tournament, players will have to make difference all over the pitch,” said the England coach.